Egyptian bloggers and activists mourned the loss of a fellow revolutionary who was killed during Sunday's Maspero clashes between demonstrators and army and security forces. Hundreds of Egyptians who had never met Mina Daniel – or, in many cases, had even heard of him before his death – attended the young man’s funeral, chanting, "We are all Mina Daniel." According to Daniel's friends, the late activist's will specified that his funeral be held in Tahrir Square, the epicentre of Egypt’s January revolution. While in the ambulance, after sustaining fatal injuries, Daniel’s last words to his friends were: “If I die, I want my funeral to be in Tahrir Square." On Monday night, thousands of mourners joined the funeral for 17 victims of the deadly Maspero clashes, including Daniel, at St. Mark’s Cathedral in Cairo’s Abbassiya district.Following the funeral, hundreds of mourners, including both Christians and Muslims, solemnly headed to Tahrir Square bearing Mina’s coffin. 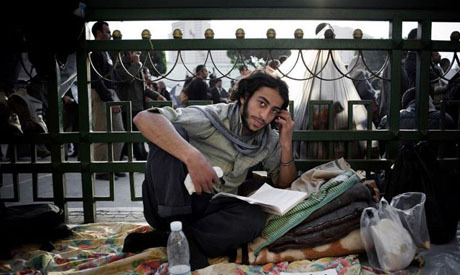 The 25-year-old activist had been an ardent participant in Egypt’s recent revolution and an active member of the Youth for Justice and Freedom movement. Daniel was injured during the infamous “Battle of the Camel” on 2 February, when pro-government thugs attacked unarmed protesters in Tahrir Square, leaving dozens killed and hundreds injured. "He always smiled," said Ahmed El-Massry, a political activist and friend of Daniel’s. "That’s something everyone will remember about him. If you look at a picture of his body, you can still see his smile." "We never differentiated between Muslim and Christian," El-Massry added. "I didn't even know he was Christian until after the revolution." Journalist and political activist Moustafa Mohi recalled Daniel's insistence on avoiding sectarian chants during the 18-day uprising. Rather, said Mohi, Daniel had promoted chants and slogans stressing national unity. "For him, it was never about Christian or Muslim demands, but about Egyptian demands," added Mohi, who had worked together with Daniel in the Socialist Popular Alliance Party. Following his funeral in Tahrir Square, Daniel's coffin was taken to the Al-Malak Church in 6 October on the outskirts of Cairo to be prepared for burial. Like Daniel, mourners at the funeral stressed the importance of Muslim-Christian unity. "This is not sectarian division," they chanted. "Muslims and Christian are one hand." The funeral was attacked in Cairo’s Ghamra district, where unknown assailants hurled rocks at mourners en route to Tahrir Square. A group of Daniel's friends have since established a page on Facebook dedicated to Daniel's memory. The group, dubbed "We are all Mina Daniel," currently boasts more than 6,000 members. Its founders hope the page will become as well-known and influential as that devoted to Khaled Said, the young Alexandrian man killed by police in 2009 whose death played a role in encouraging the revolution. "The ‘We are all Khaled Said’ campaign made a difference in the Egyptian movement for democracy," said Mohi. "Similarly, I hope Mina's death will make the difference that he wanted to achieve in his life." Daniel’s autopsy report has been published online by his friends. The report attributes the young activist’s death to a bullet wound to the heart. In Christ Mina will live! Condolences and a salute to Mina and all the Coptic martyrs of the Maspero Massacre.